(CNN) Michigan State University interim president John Engler resigned Wednesday after he, again, made controversial remarks about the girls and young women who were Larry Nassar’s victims, the school said. The Michigan State University board of trustees intended to consider Engler’s ouster Thursday but will now discuss the president’s transition, university spokeswoman Emily Guerrant said. “When I arrived I found a university in crisis. Cascading disclosures of sexual abuse by former Michigan State University and USA Gymnastics sports doctor Larry Nassar by early 2018 had made MSU a troubled institution,” he wrote. “The bottom line is that MSU is a dramatically better, stronger institution than a year ago,” he wrote. Engler’s most recent troubling remarks came last week in an interview with The Detroit News editorial board. In the final paragraph of a story about which victims the school’s Healing Assistance Fund would benefit, Engler was quoted as saying there were people who were “hanging on” to the Nassar issue. 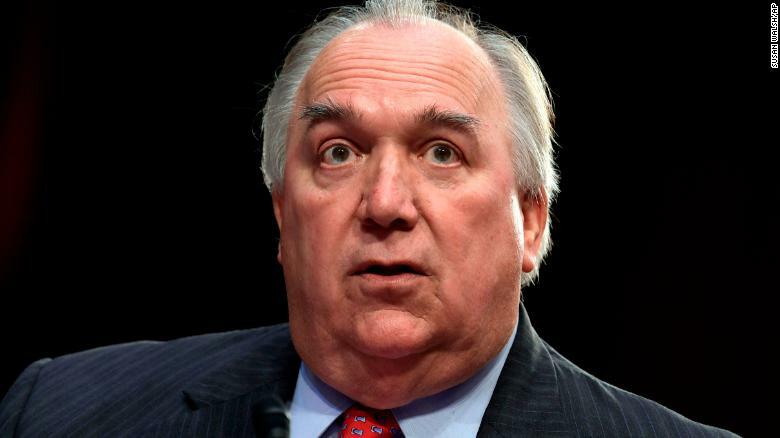 John Engler became Michigan State University’s interim president last year. In a separate story, the former Michigan governor and legislator refuted an allegation made in a state attorney general’s report that the university “stonewalls” investigators in the Nassar probe. Engler said he had empathy for the victims and lauded the school’s efforts in sexual assault prevention and education, according to the newspaper. Tell me more about how enjoyable this spotlight is. When you are eager to “get back to work” and move on from the worst case of serial sexual predation of minors in decades while obstructing attempts to get to the bottom of what happened… Well, it tells everyone a lot about what sort of a person you are. He is thumbing his nose at the board right now. This is a huge test for the new board members, especially @Brianna4MSU. Will they support efforts for actual change and accountability, or are they going to be defenders of the status quo they were elected to challenge? Dianne Byrum, chairwoman of the board of trustees and co-chair of the presidential search committee, tweeted Saturday that Engler was in no position to determine who the healing fund would benefit. That’s a board matter, she wrote. JOHN ENGLER’S REIGN OF TERROR IS OVER. None of the eight trustees returned CNN’s calls seeking comment. Following Engler’s resignation, John Manly, an attorney representing Nassar’s victims, said the interim president’s ouster was “long overdue” as Engler’s actions had “continued to revictimize” his clients. It’s sad, Manly said, that it took the spotlight comments to force his resignation. The board of trustees first considered Engler’s ouster in June after it was revealed that Engler sent an email accusing Rachael Denhollander of possibly taking payoffs to manipulate other survivors, according to The Chronicle of Higher Education, which obtained the email through an open records request. “The survivors now are being manipulated by trial lawyers who in the end will each get millions of dollars more than any of individual survivors with the exception of Denhollander who is likely to get kickback from Manly for her role in the trial lawyer manipulation,” the April email said, The Chronicle reported. Engler apologized, but in comments to The Chronicle at the time, Denhollander questioned how someone with Engler’s mindset could solve Michigan State’s problems. It was time for Engler to go, she said. “It is out of his comprehension that someone would do something for anything other than money and power. I am not getting kickbacks, ever,” she told The Chronicle. “John’s apology for the comments contained in an April email that was released last week is appropriate and appreciated by a majority of the Board,” then-board Chairman Brian Breslin said in a statement that touted Engler’s “key leadership” amid the scandal. Even then, Engler did not take the university’s helm without controversy. Though he vowed to make sexual assault survivors the primary focus of his tenure, critics of his selection decried the lack of faculty and student input. Opponents also pointed out that, as Michigan’s governor through much of the 1990s, he refused to grant US Justice Department and United Nations investigators access to the state’s female prisons amid accusations that inmates were being raped and sexually abused.